Today it was quite cold, so the chiller was idle. However on hot summer days this would be humming like a kitten. As a former chemical engineer, I look at a machine like this and think about how much the Carnot cycle influences our daily life. This machine is a perfect example of the Carnot cycle in action. For those without an engineering background, in engineering and thermodynamics, a heat engine converts heat energy to mechanical work by using the temperature difference between a hot "source" and a cold "sink". Heat is transferred from the source, through the "working body" of the engine, to the "sink", and in this process some of the heat changes into work by using the qualities of the gas or liquid inside the engine. In this case, the engine is a chiller plant powered by a large compressor. The compressor is powered by electricity, and during decompression, "coolth" is generated. 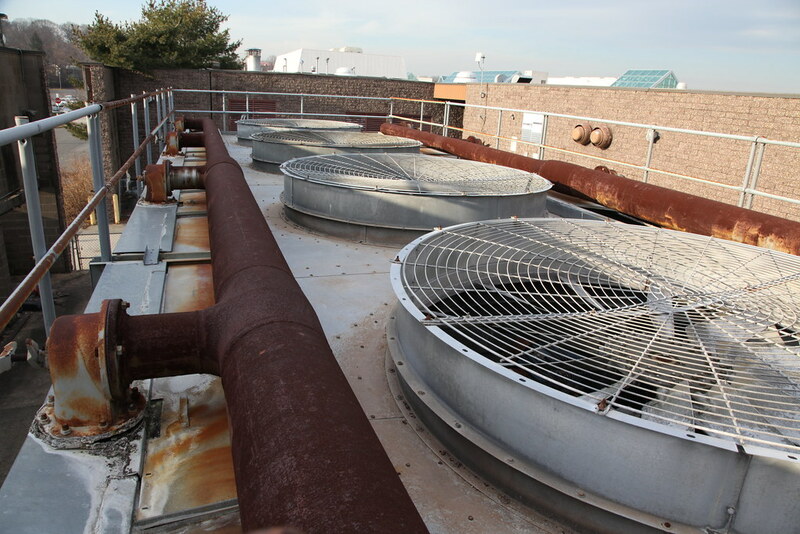 The coolth is piped into the mall, and radiated out into the air through condensers in the individual stores. Air conditioning, that's how it works.